40K Neophyte: You Will Be Motivated...or else. You Will Be Motivated...or else. So the time sink du jour for me lately has been tooling around motivatedphotos.com looking at the humorous and demotivational posters. The site has been around for a while, and this isn't the first time I've spent time there. This time, though, I really took notice of their Warhammer 40K posters. 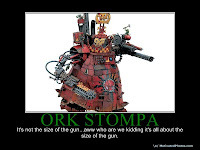 There is this funny Obliterators Poster, this one that combines my love of 40K and bathroom humor, this poster about 40K classic edition, and the one with the greatest Ork gun ever. For the record, I like Steve's better...except for all those Space Marines on there. 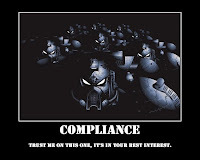 Anybody else got a 40K motivational poster they created, or a favorite 40K motivational poster on the internet? I love these things. those are excellent! Thanks for sharing!